Balboa et al. (Chile). Evaluación in vitro de la actividad antimicrobiana de un propóleo chileno sobre muestras clínicas de exudados bucofaríngeos y cepas ATCC..
Küpeli Akkol et al. (Turquia). Polygala anatolica Boiss. et Heldr. : Is a potential remedy for in ammation and pain? Benites et al. (Chile). Chemical composition, in vitro cytotoxic and antioxidant activities of the essential oil of Peruvian Minthostachys mollis Griseb. Valdes et al. (Chile). Evaluación in vitro of proliferative activity of epithelial cells by avonoid 3-O-methylgalangine and terpenenic derivative Filifolinone. Semenya et al. (Sudafrica). 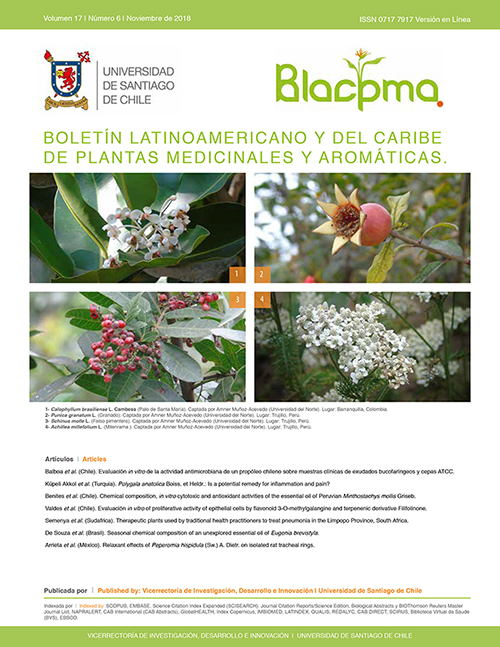 Therapeutic plants used by traditional health practitioners to treat pneumonia in the Limpopo Province, South Africa. De Souza et al. (Brasil). Seasonal chemical composition of an unexplored essential oil of Eugenia brevistyla. Arrieta et al. (México). Relaxant effects of Peperomia hispidula (Sw.) A. Dietr. on isolated rat tracheal rings..